Over the summer, the Golden State Warriors were deeply involved in trade talks with the Minnesota Timberwolves for Kevin Love. 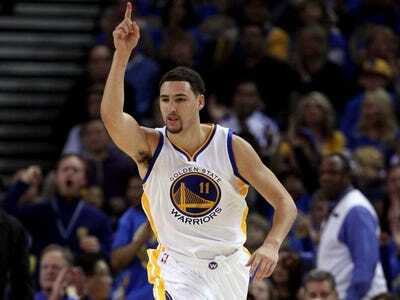 The talks eventually stalled out because of the Warriors’ reported refusal to give up shooting guard Klay Thompson. The Warriors valued the 24-year-old Thompson as a two-way guard and a complement to backcourt mate Steph Curry. The Warriors’ refusal to trade Thompson was moderately criticised by some and mocked by others. Kevin Love is one of the best big men in the game — a monster rebounder and scorer that creates matchup nightmares for defenses. He and Curry would instantly become a dynamic offensive duo. Four months later, Klay Thompson is making the Warriors’ front office look smart. He’s off to the best start of his NBA career after breaking out at this summer’s basketball World Cup. The FIBA World Cup is the second-biggest international tournament in the world, but it’s a level below the Olympics in popularity and importance, particularly in the NBA. The game’s biggest stars often sit out of it, leaving the NBA’s second tier of stars to compete. Thompson was one of several backcourt players competing for a spot on the 12-man roster. He eventually made the team, beating out players like John Wall, Damian Lillard, Chandler Parsons, and Gordon Hayward. Thompson ending up having a fantastic tournament, averaging 12.7 points per game (second on the team) on 51.3% shooting. In the U.S.’s final four games leading up to winning the gold medal, he averaged 15.7 points on 55.5% shooting with three rebounds per game. 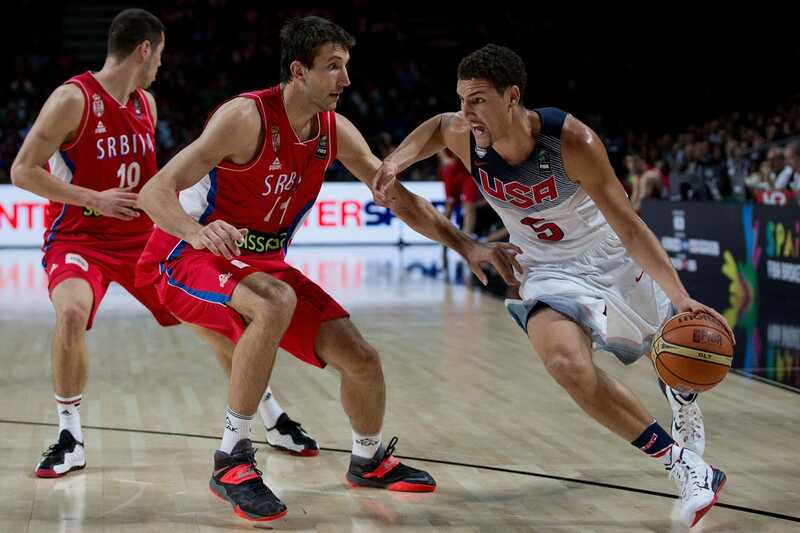 There seems to be a trend in the NBA of players having breakout seasons following the FIBA World Cup. After winning gold in the 2010 tournament, Derrick Rose and Kevin Durant, rising stars at the time, went on to win MVP and lead the NBA in scoring, respectively. The same thing is happening with Thompson. Through four games, the Warriors are undefeated at 4-0 while Thompson is leading the NBA in scoring at 29.7 points per game on a ridiculous shooting percentages of 53.7% FG, 45.5% 3FG, and 91.7% FT.
With Thompson on the court, the Warriors are blowing teams out. They have a 105.3 offensive rating (points scored per 100 possessions) and a 85.4 defensive rating (points allowed per 100 possessions) when Thompson plays. Thompson may not have the best all-around game — he lacks in creating for others and rebounding — but there will always be immense value in having a high-scoring, efficient shooting guard who can guard multiple positions. Especially when he can be paired with a player like Steph Curry. It will be tough for Thompson to sustain these lofty scoring numbers, but in the meantime, the Warriors will continue to enjoy Thompson’s breakout, especially after rewarding him with a 4-year, $US70-million extension.